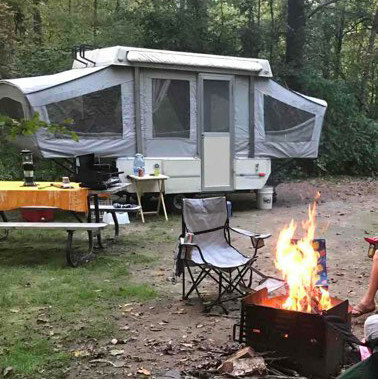 cozy and easy to tow for your next weekend in the woods. this trailer is very simple to set-up, lightweight and easy to tow and manoeuver. it can be towed by suv and even a car . it has an 8’ box and jacks on one end. is 15' end to end when opened up and has a 15’ cable to plug in for power and an 10’ x 8’ awning. new mattresses 2015 & some new canvas and screens 2018. Use care and time while erecting the trailer. Mattresses, basic kitchen / eating and cooking items. 2 double bed pull outs & a fold down single dinette. no smoking inside trailer and pets on the floor of trailer only, notnon beds. i will demo the set up and tear down of the trailer as it is slightly different with the newer mattresses.